While Superman has long been one of my favourite comic book characters - if not the favourite - I often prefer the stories featuring second-tier characters such as Green Arrow (aka Oliver Queen) and Black Canary (aka Dinah Lance), mostly because it seems like the writers and artists feel more comfortable taking chances and exploring the boundaries of the medium. For example, during the "Dollar Comic" era of World's Finest, when each issue was super-sized and featured a half-dozen characters in four different stories, I looked forward to the Black Canary/Green Arrow stories most, because I enjoyed their tempestuous relationship. "This Earth 2 deal, going home, finding yourself, all of it's part of the mood you get in. A few days, you'll be over it." "Do you seriously think my problems are biological? That I'm like a faucet you can turn on and off?" It seems pretty clear to me that Oliver is attributing Dinah's current feelings to her period - edgy stuff for a comic book allegedly targeted at kids! 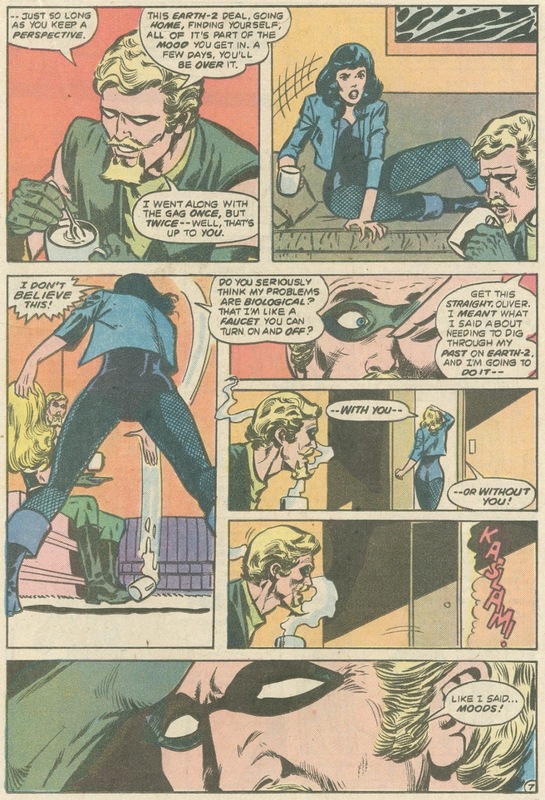 From an adult perspective, Green Arrow's dismissive behaviour is revealed as almost hilariously sexist and blockheaded; my sympathies now lie entirely with Dinah. No wonder their on-again, off-again relationship didn't work out in the end. Not his finest moment indeed. No one understands women, not even superheroes.